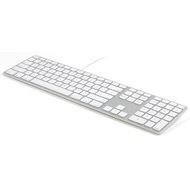 This keyboard is for the people who miss Apple's Wired Keyboard with Numeric Keypad. The Matias Wired Aluminum Keyboard for Mac has a beautiful silver aluminum case with traditional white keycaps, just like you remember. It brings you the 2 port USB 2.0 hub that you have always found useful, as well as the special Mac functions that you know and like. 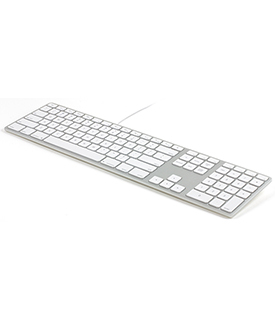 It has Matias scissor switches for a slim and comfortable typing experience. 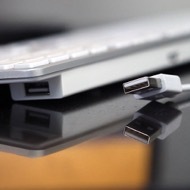 Of course, it also connects to your Mac by a traditional USB cable, hard-wired right into the keyboard. Matias couldn't help but make at least one improvement to the traditional Apple design — they've added a volume control dial along the top edge of the keyboard, to give you more precise control of the volume of your speakers — but if you want to do everything the traditional Apple way, we also include volume keys on the keyboard too. Rating: 3/5 Frustrated by odd behavior March 21, 2019 I LOVE that it has the look and feel of the original Apple wired keyboard. It does that VERY well, sadly though one minor issue and one might be fatal. Because the Apple devices have a slightly unique USB connector, this one can't match that and didn't connect to an Apple USB extension. cable. No biggie. BUT it seems like it isn't accurate. .There are times I'm typing when I get extra periods and spaces that I didn't add in. I thought I was getting "sloppy" but I don't see this on other keyboards on laptops etc. I didn't clean this text and see some of those artifacts as I'm typing. It's now a few months old but has been like this, I think since day one. It's hard to replicate the issue. Very intermittent but I need to be VERY careful ALL the time because of it. Rating: 5/5 Much like the original November 19, 2018 Got it quick. It's almost exactly like the original, except I turn the thumb drives over to fit. Love it.